Can Millennials Revive the American City? The American city has been on the receiving end of devastating trends: disinvestment, disintegration of infrastructure, depopulation, deterioration of law and order and destruction of public education. Now, emerging trends might provide a counterbalance. The millennial generation and the New Urbanism movement, which both grew from the same roots in the 1980s, are providing the American city with powerful policy opportunities. Millennials, attracted to New Urbanism neighborhoods created by community development, might power the revival of the American city. The millennial generation has an interest in urban living and the resources to support it. New Urbanism creates a change in traditional community redevelopment goals. Urban resource disinvestment has created opportunities for turning liabilities into assets. Who are the millennials that could help revive the American city? What is a New Urbanism neighborhood? Walkable access: mixed use neighborhoods with pedestrian connections within a five-minute walk. Higher density development: smaller lot size and multistory mixed-use structures. Urban scale: buildings and roads facilitating connections between people. Local parks: enhanced for accessible recreational activities and community meetings. Traffic-calming transit designs: traffic circles for arterial intersections and dedicated bike paths. Auto-free zones: public spaces offering relief from carbon-monoxide pollution. People-oriented public spaces: open areas, sidewalks, cafes and front porches to host public life. 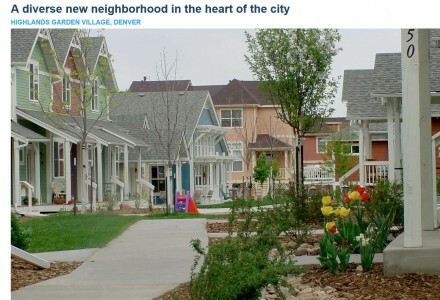 How does a community create a New Urbanism neighborhood? Photo courtesy of the Rose Companies. Planning: establishing geographical units that relate to demographic characteristics. Zoning: modifying traditional regulations to incorporate “New Urbanism” standards. Building codes: revising limitations and establishing requirements for urban features. Public investment: relocating governmental offices to neighborhood sites. Infrastructure improvements: enhancing neighborhood amenities like parks and transit ways. Neighborhood organizations: providing professional staff for volunteer groups. Social service support: moving services to the neighborhood from central offices. Social media: developing content to create neighborhood identity and cohesion. Existing expenditures can be refocused. Community policing offices can be opened in vacant store fronts. Fire stations can be opened up to the neighborhood. Capital improvement districts can be created to finance public improvements. Federal CDBG funding can be allocated based on New Urbanism impacts. Philanthropic investment can be promoted, including funding for neighborhood community development organizations. Resources that millennials have, or will have as baby boomers pass on $30 trillion in the intergenerational transfer of wealth, can be tapped. School systems can adopt neighborhood schools to coincide with New Urbanism boundaries. Creating New Urbanism neighborhoods requires a community commitment. Robert Steuteville, senior communications advisor for the CNU, lays out the process. “A community has to show millennials that it is committed to creating places where people want to live.” Political, social and economic institutions must come together to adopt New Urbanism as a strategy for sustaining the urban core. The good news: it’s been done before. The CNU provides resources to assist with public policy, community decision-making, marketing and financing based on the growing demand. CNU will provide a welcome reception and support for communities that adopt a “New Urbanism” strategy for attracting millennials. The opportunity is real. Millennials, working in partnership with community development, can play a powerful role in reviving the American city, neighborhood by neighborhood. Author: Minch Lewis is an adjunct professor at Syracuse University’s Maxwell School. He served as the elected city auditor in Syracuse, New York for nine years and has developed financial management systems for the affordable housing industry. He earned his master’s degree in public administration at the Maxwell School. He is a certified government financial manager. Email: [email protected]. 2 Responses to Can Millennials Revive the American City? I found Professor Lewis article to informative and optimistic. This article inspired me to get a better understanding of the Congress for New Urbanism core values to obtain ideas that can be used in post-industrial cities in New Jersey. Apologies for not replying sooner. I am particularly interested in any ways that you can implement New Urbanism strategies. I hope you will share your experiences.